Home Batch Tasks Revit Add in How to detach multiple Central Revit files (Batch Detach) and export to Navisworks at the same time with Cherry BIM tools ? Detach model from Revit central files and export file to NWC (Navisworks format) are one of the most common task you need to do before sending your model to your clients. This function is already provided in Revit by default, but unfortunately, Revit only allow you to detach manually and one by one files. And if you need to export to NWC files, you need to finished detach model and export to NWC manually as well. These tasks would be painful, if you have many files to send. That's why I created this add in to help you save your time and also enhance your BIM workflow. Remove all CAD Links: Choose this option if you want to remove all the unnecessarily Auto CAD link in the Central Revit files. Not save Detached models: Choose this option if you only want to detach model then export to NWC file without saving them. 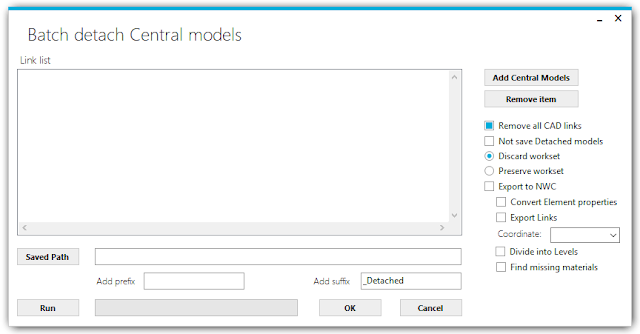 Discard workset: choose this option if you want to discard the workset of the central model. 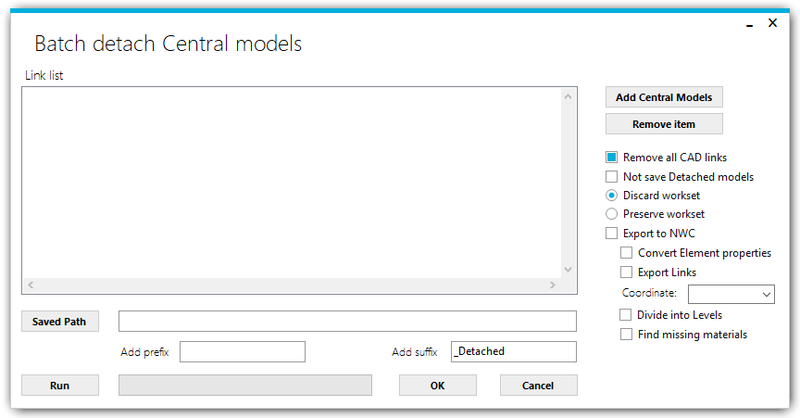 Preserve workset: choose this option if you want to preserve the workset of the central model. 4. Saved Path: click this button to choose the output folder. You can also copy paste the path into the text box beside the Saved Path button. If you want to add suffix or prefix for the output file, you can define in the suffix and prefix text box. 5. Run: click this button to start the process. The waiting time is depended on how many files you need to link into model. The finishing percentage is displayed by the progress bar.